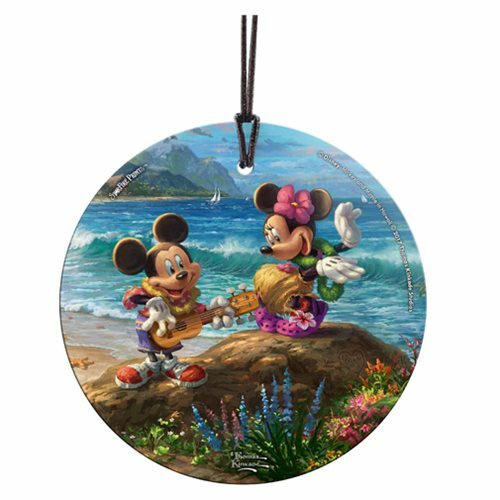 This 3 1/2-inch diameter Mickey and Minnie in Hawaii Thomas Kinkade Starfire Prints Hanging Glass Print features a Thomas Kinkade Studios tropical scene starring Mickey Mouse and Minnie Mouse. Mickey plays the ukulele while Minnie dances a hula, and like all the art from Thomas Kinkade Studios, this image is full of charming details, from the tiny hearts in Minnie's sandals to the carved initials in the stone. The image is fused directly and permanently into the glass for a dazzling, light-catching display that's perfect for any tree or window year-round! A hanging string is included.